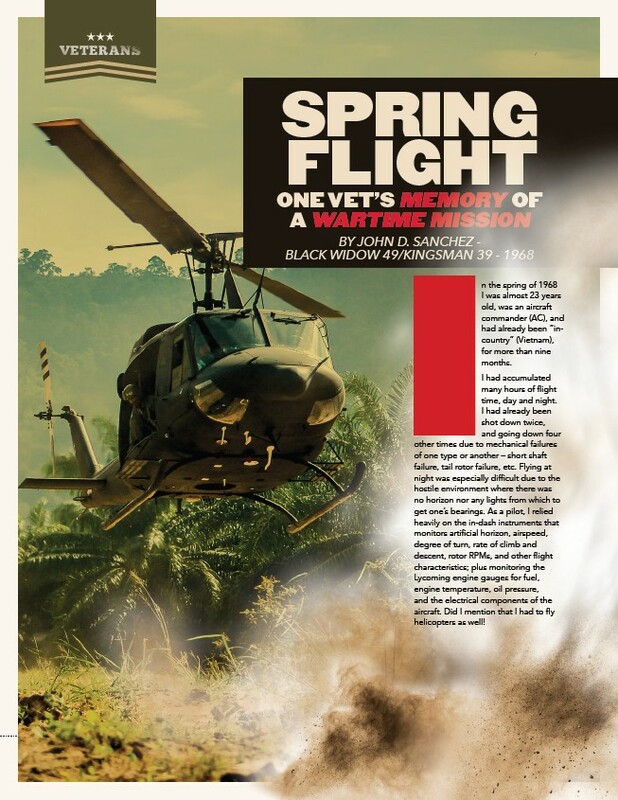 12 Innovative Health - National Fall 2017 Online Spring 2018 90 SPRING FLIGHT ONE VET’S MEMORY OF A WARTIME MISSION by John D. Sanchez - Black Widow 49/KINGSMAN 39 - 1968 BY JOHN D. SANCHEZ - BLACK WIDOW 49/KINGSMAN 39 - 1968 VETERANS In the spring of 1968 I was almost 23 years old, was an aircraft commander (AC), and had already been “in-country” (Vietnam), for more than nine months. I had accumulated many hours of flight time, day and night. I had already been shot down twice, and going down four other times due to mechanical failures of one type or another – short shaft failure, tail rotor failure, etc. Flying at night was especially difficult due to the hostile environment where there was no horizon nor any lights from which to get one’s bearings. As a pilot, I relied heavily on the in-dash instruments that monitors artificial horizon, airspeed, degree of turn, rate of climb and descent, rotor RPMs, and other flight characteristics; plus monitoring the Lycoming engine gauges for fuel, engine temperature, oil pressure, and the electrical components of the aircraft. Did I mention that I had to fly helicopters as well!